This party would be way more fun if their platform were built around parrots, peg legs and snarls of "Arrrr." 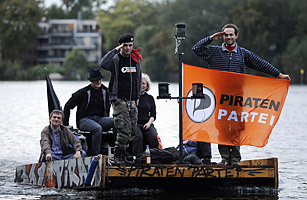 But the Pirate Party has won plenty of adherents with its demands for copyright and patent-law reforms and fierce advocacy of privacy rights: started by computer nerds in Sweden in 2006, it is now the country's third largest party by membership. Copycat groups have grown up in 33 countries, giving rise to the umbrella organization Pirate Parties International.